Where is your reference to "scalding" water. Are you referring to streams/mists coming up from the ground? Is your assumption that these are geysers? That refers to the period of earth history prior to the deluge, before seasonal rainfall....? Thats just a bible story which I assumed everyone was familiar with. If you search 'hot water floods in myth' there's plenty out there from around the world. f you have a copy of 'When the earth nearly died' skip to page 186 where numerous others are mentioned. So this is a recollection of human memory, not some distant geological era. As far as I'm aware no one has done the math on the implications of the amount of kinetic energy expressed as the earth slowed, and then sped up again. I'll open a thread in NIAMI if no one runs with it here. I see the erosion of uplifted planation surfaces more in the way of a spark erosion but I would certainly not rule out dust devils in a highly electrified atmosphere. From the image in the above link, are we really seeing an “inverted dendritic stream channel”? I would suggest not. The pattern arose as a result of an electrical discharge the same process that carved dendritic patterns in newly formed mountain ranges on Earth. The section quoted from Wikipedia simply states the popular simplistic view of the nature of granite, geologists know this is not the case, this is why it is promoted, it is harder to say “we don’t know”. Click ‘view image’ for map. Next, recognised orogenic belts assigned to imaginary time periods by geologists. But what of granite itself? “Rocks that were originally sandstones, limestones and slates have been found mysteriously changed by nature into granite. This is a most surprising phenomenon, since geologists heretofore have classed granite as a type of igneous rock that developed from a molten mass of material formed at considerable distances below the earth’s surface. Granite is the name given to a family of rock assemblages formed by modification of existing igneous, metamorphic and sedimentary rocks by processes not completely understood, sometimes the modification can happen with the parent rock(s) in the ‘solid state’. 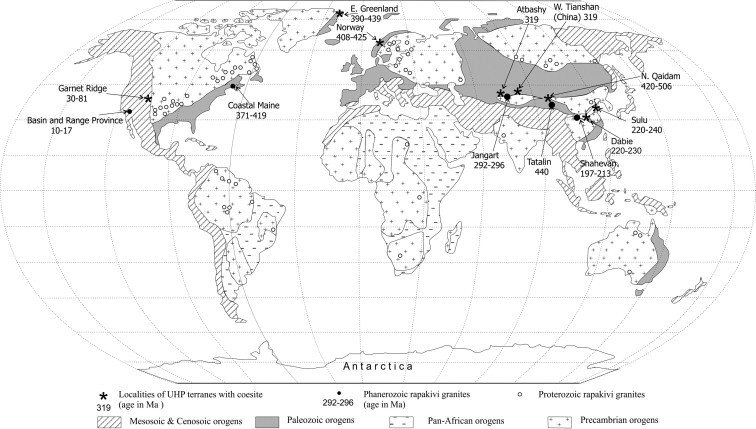 This observation casts doubt on the existence of ‘Precambrian’ granite- wherever it is found on the globe- how do we know ‘Precambrian’ granite did not form ‘recently’ through granitization? Similarly an electrical origin of granite and tectonic uplift cannot be ruled out, indeed I consider this more likely as generally geologists do not consider electricity to be a rock forming/ altering agent. “The Andes cover an area of approximately 3 x 106 km2; they have been uplifted by between 2 and 4 km, say 3 km on average. The uplift has occurred in the form of a horst, i.e. as a block bounded by vertical faults. We may therefore consider that the uplift was due to thermal expansion of the crust directly under the uplifted area. “One model assumes that uplift could be due to the 8% expansion of basalt on partial melting. To generate an uplift of 3 km over the Andes would require 37.5 km depth of basaltic crust to be partially melted under the entire range. Assuming, conservatively, that there was no initial heating from magma at depth and that the crust was initially at 20 degrees Celsius throughout, and taking the density of basalt as 2.7 x 103 kg/m3 and the specific heat as 0.84 kJ/kg (Engineering Toolbox, 2014), the eutectic temperature of a typical basalt as 1,270 degrees Celsius and the latent heat of fusion as 506 kJ/kg (Kojitani and Akaogi, 1995), then the energy required to fully melt 37.5 km of basalt under the entire Andes is approximately 5 x 1026 Joules or 5 x 1033 erg. “One of the main problems for the origin of loess is that quartz in igneous and metamorphic rocks has a mean grain size of approximately 700 μm, while the main size of detrital quartz in 60 μm. The cut-off between sand and silt is 63 μm and most loess is in the range of 20 to 50 μm. “So, the size of the quartz has to be reduced 90% from its source to account for the formation of loess. How does this happen? “Four sources of loess have been proposed: (1) hot deserts, (2) cold deserts, (3) drowned sources covered by late-glacial sea level rise and (4) glacial grinding. All these sources raise questions. Hot and cold deserts do not produce significant quantities of loess. There are problems associated with the origin of loess from continental shelves, now underwater, since many loess belts are far inland from the sea. “It had been assumed that the formation of loess was only by subglacial grinding. However, loess has been discovered in areas far from present or past glaciers or ice sheets, such as in northern Tunisia, northern Nigeria, Israel and Saudi Arabia. Minor amounts of loess have even been found in the Sahara Desert. Furthermore, experiments have shown that glacial grinding does not produce much silt. This deduction is reinforced by the observation that hardly any loess is produced by or deposited in front of present-day glaciers. I am not suggesting that loess was not distributed by winds during a cataclysm, I believe it was. Windblown loess (dust) entombed many unsuspecting mammals during the latter stage of the cataclysm (http://creation.com/woolly-mammoths-choked-by-dust). “So, there does not appear to be a viable source for the immense volume of loess.” I propose that we do when we consider the graphic you supplied, we see that the vast deposits of loess are very closely associated with mountain ranges or areas of uplift. Eroded uplifted planation surfaces provided a source of quartz. The planation surfaces themselves had previously been inundated by immense tides and covered by freshly eroded sediment. 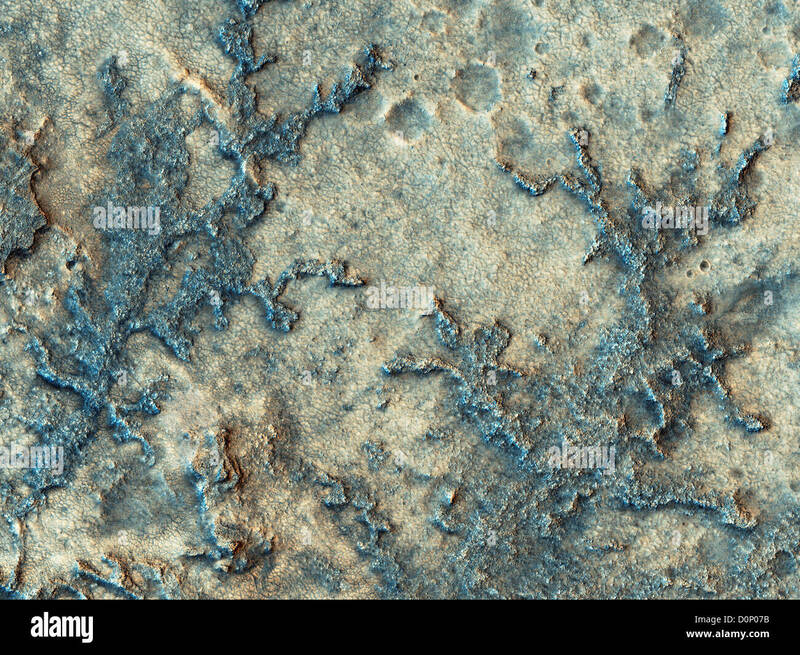 This already abraded sediment was further abraded by electrical forces during the period of uplift supplying plenty of loess to be whipped up by winds. Compare the composition of the ash layer given in the link above with the worldwide average chemical composition of granite, by weight percent: SiO2 — 72.04% (silica) Al2O3 — 14.42% (alumina) K2O— 4.12% Na2O — 3.69% CaO — 1.82% FeO — 1.68% Fe2O3 — 1.22% MgO — 0.71% TiO2 — 0.30% P2O5 — 0.12% MnO — 0.05%. Based on 2485 analyses. The Worzel Deep Sea Ash could very well be eroded granite- given that we have previously seen the vague definition of just what makes granite. New here to the forum. I am writing a fiction novel, the third in a series and this takes place pre-flood, that is from around the Toba Event to the beginning of the Holocene. I have already written how the end of the Ice Age was due to a cosmic event: Comet or bolide. I had not considered EU until two days ago when I listened to a Grimerica Podcast featuring Wal Thornhill. I find the EU theory interesting and and have no bias one way or another regarding Venus as the Comet or the EU Theory as it does fit into the paradigm of the end of the Younger Dryas. Here's where I am having a problem understanding and maybe someone can help me out...that Earth was a moon of Saturn and furthermore that Saturn/Earth made its way here from another constellation. I just don't see how that fits in with even "alternative archeology/geology" Gunung Padang is being dated to 25Kya. Austral-Asians (aboriginals) settled Australia at least 50Kya. Flores Island was settled maybe one million years ago with humans crossing the Wallace Line by boat from Sundaland. I could wrap my head around the idea that such a thing happened say 250 mya or something along those lines. I appreciate the knowledge that will be provided here. that faith you have in the datings you provide is the real issue. Generally we here believe that things were a lot more electrical ending about 5,000 years ago. Heightened electricity can produce transmutations and speed up rates of radioactive decay. So that the isotope ratios are a result of electricity and not time. Until you can free yourself from the dates EU will be untenable. So you would probably need to invent another stellar system where electrical effects abound. Certainly would be spectacular! And plenty of scope for imagination. Thank you Mo for your reply...I will have to research this more. Let me ask if I may regarding Dr. John Brandenburg's theory regarding nuclear explosion/s of some sort 200mya based upon isotope decay rates. Would the electrical universe theory somehow play a role in this? Such theories have many assumptions which are likely to be incorrect. The isotope ratios seem to be different on Mars even compared with Martian meteorites. Mars was likely scourged by discharge between Mars and some other body, such that the other body was in line with the then axis of Mars. This is because a lot more material was removed from one hemisphere of Mars. One could also theorise that a super large explosion blew the material away, but that is not for me at the moment. Most likely is that the Martian material was removed in an orbit similar to how the same face of the Moon always faces Earth, or the way Io discharges. has lots of evidence that the cataclysm/s occurred somewhat more than 4,000 years ago. The entire surface of the continents was covered with an average of 2 km or so of sediment, so nothing can be dated accurately from before the cataclysms. I quoted Brown who referenced a German study in the 1990s that showed that ionization of radioactive elements causes them to decay billions of times faster than normal. So Brown explained that electric forces would have produced radioactive elements by fusion during the cataclysm/s and then caused many of them to decay rapidly. I explained how Sedimentary Rock Strata Prove Catastrophism. Robert, very interesting info. I'll get back to this later today or this week. 1. Robert, I'd like you to explain what you think the rock type was that became granite in the mountain belts. I know from living in New Hampshire a few years ago that the rock there is granite that appears to have been previously sedimentary rock, as the layers are usually easy to observe. 2. Do you acknowledge that the continents consist of less dense rock than the seafloors, about 2.7g/cc? 3. Do you agree that seismic waves show the densities of rock under the continents and the seafloors? The main element components are Al, Si, O, OH, sometimes with Ca, K, Fe, Mg and/or Na, especially for the last four. It looks like most rocks are very close to the density of granite. What would electric currents transform into granite? What mineral type did Michael Steinbacher turn into granite? Looking at the uplift of the Andes if the earth stopped spinning almost all the seawater would rush to the poles carrying huge amounts of sediment with it, https://www.youtube.com/watch?v=eJfOWfaP6RI&t=390s around 5:00 and 6:30 "up to 20 kilometers of sediment" . Kinetic energy would heat and loosen things up more near the equator too making uplift easier. Not to mention all the ores which would be dissolved in supercritical water filling the voids. 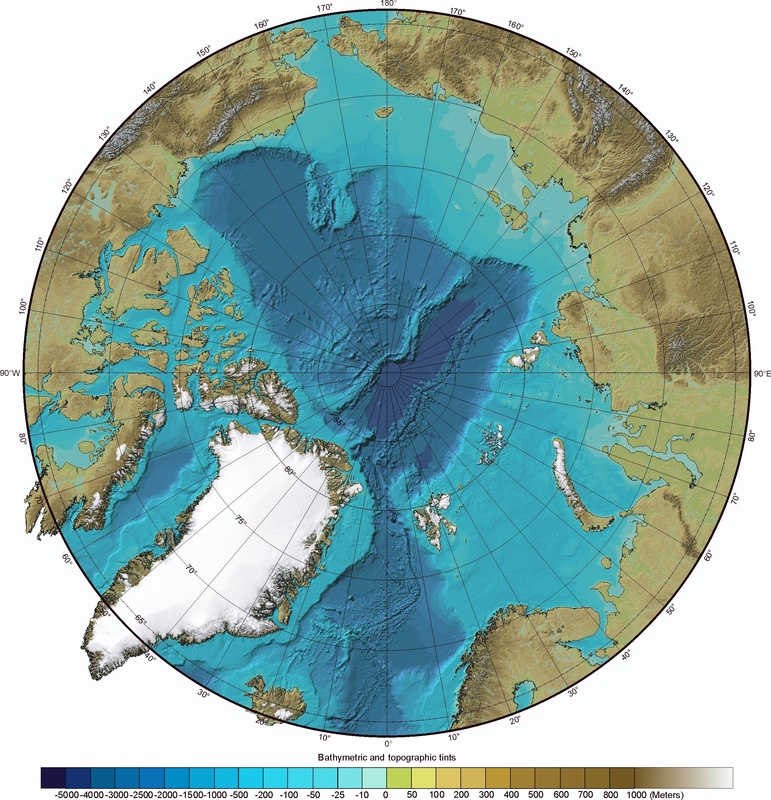 Look at the bathymetry of the arctic and that huge mass that could have overwhelmed Beringia. http://geology.com/world/arctic-ocean-b ... ry-map.jpg At the resumption of spin the water would follow very different paths south, scouring the landscape again, some of it above 100c[?] . Then the further south the water went the more energy would be sucked out of it by the same kinetic energy, until it freezes? with all it's sediment in place? to slowly consolidate as it thaws. Comet mesa and crater erosion by electrical surface erosion. See electrical erosion of Comet Temple I in the 47 to 50 minute segment of this video. A mesa on Temple I shows electrical[?] erosion over a short period of time in 2005, shortening the mesa by 50 meters after sunspot and solar wind activity had increased significantly. The problems with radiometric dating are well documented. From the above paragraph we see that radioactive isotopes present the appearance of being there for millions to billions of years- the moment the first appear. ‘New’ polonium and uranium were created in situ by powerful thunderbolts, these freshly created elements already carried the signature of being there for ‘millions’ and ‘billions’ of years. The weakness in radiometric dating is made obvious by geologists themselves, in strata where the ‘age’ is ‘known’, say Triassic for example, and we find discordant radiometric dates associated with that strata, geologist always defer to the evolutionary timescale- the timescale always wins over the data; yet geologists tell us: “The chronostratigraphic scale is an agreed convention, whereas its calibration to linear time is a matter for discovery or estimation.” (Gradstein, F.M; A Geologic Time Scale, CUP, 2004)The timescale is an ‘agreed convention’! When radiometric dates do not agree with the ‘agreed convention’ geologists turn to biostratigraphy, biostratigraphy in turn depends on the reality of evolution by natural selection- the rocks should contain a full representative record of evolutionary progress- but they do not. The whole geologic timescale is a house of cards with no foundation regardless of the problems with radiometric dating. 1. The original source rocks in many areas that have undergone uplift are usually described as metamorphic and sedimentary- we can assume that a wide variety of rocks can contribute to the formation of granite given where granite is found and its broad definition. “Can an electric current lithify loose sediment? A few years ago, I met a prospector who had been experimenting with running electrical current from a welder through stream sediment. He was surprised to find that when the material in his crucibles cooled, it was indistinguishable from rocks that he saw while prospecting. “Granite, basalt, and schist, often appeared in layers that mimicked the strata in the mountains. It occurred to him that strata, perhaps even whole mountains, could be caused electrically. “He immediately dismissed the idea: Where would the welder be, the source of the current? “When I told him about plasma and the space currents that surrounded and likely penetrated the Earth, his idea regained plausibility. If a surge in space currents should generate something like an “enhanced aurora” that swept across and into the surface, there could be more than enough power to “weld” “superposed strata form[ed] simultaneously” into rocks—not gradually over millions of years but in hours. Others may wish to contribute if they have first-hand knowledge of Michael Steinbacher’s work. _Robert, I asked: Do you acknowledge that the continents consist of less dense rock than the seafloors, about 2.7g/cc? _Questions: Do you agree that granite has the same density and element abundances as granite? _And do you agree that granite comes from rock of the same element abundances and density as granite? _Or do you contend that granite mostly comes from basalt, which is more mafic, I think? _If so, do you know of evidence that electric currents can form granite from basalt? And what then would become of the mafic content? _I asked: Do you agree that seismic waves show the densities of rock under the continents and the seafloors? _Question: Aren't geologists able to determine in the lab what the seismic wave velocities are for rocks of all densities? _Question: Why would Potassium (K) be missing in Worzel Ash if it came from granite? _I asked: What mineral type would electric currents transform into granite? _You replied: a wide variety of rocks can contribute to the formation of granite given where granite is found and its broad definition. _... a prospector ... had been experimenting with running electrical current from a welder through stream sediment. _“Granite, basalt, and schist, often appeared in layers that mimicked the strata in the mountains. _there could be more than enough power to “weld” “superposed strata formed simultaneously” into rocks — not gradually over millions of years but in hours. _Questions: Do you know of anyone doing or having done experiments on electrical formation of granite, basalt, schist etc? _Do you agree that sedimentary rock was not formed electrically, but by megatsunami deposition? _Question: But is there any evidence it can do this in solid material? _That appears to be possible electrical erosion on a comet, which apparently occurred during increased solar wind activity in 2005 or so. _Questions: But I don't know of any evidence that electric currents can expand rock. Do you? I mean in order to form the mountain ranges? _Is anyone doing experiments to test if electricity can expand rock? If not, why not? _Questions: Doesn't the separation between batholiths suggest there was no continuous electric current from southern South American Andes to the northern end of the North American Rockies, or vice versa, assuming batholiths were formed electrically? _Did you know that Dwardu Cardona concluded that continental drift is real? _Which of Mike Fischer's evidence at http://NewGeology.us do you dispute? _If the east coasts of the Americas fit the west coasts of Europe and Africa very well and even have the same rock and fossil types, as they do where the coasts would have originally been adjacent, and if the Moho is a frictionless plasma layer over which the continents could slide easily after an impact, and if the impact evidence is available, as it is, what would make (rapid) continental drift impossible? _Questions: Do you agree that the Earth's crust has the same density and element abundances as granite? _And do you agree that granite comes from rock of the same element abundances and density as the crust? Underground functions are complex. A lot of the work comes from 5 specific elements, and then electron neutrinos passing through earth moving slower than them and their isotopes. These would be mainly, Bismuth/Arsenic/Nitrogen type elements, with two other elements that were not rediscovered until fairly recent times. All of these elements replace the neutron of not being able to touch something physically, with the proton of causing oxygen type elements to propel into magnesium type elements. These elements work in layers I believe, where each element mentioned has 4 other atomically related elements. Bismuth - Magma pushing oxygen elements into magnesium elements/Alberton strong wind pushing oxygen type elements into magnesium type elements : ground surface. Arsenic - material pressure pushing oxygen into magnesium/Tracion - plasma pushing oxygen into magnesium : under ground surface. Nitrogen/Nitrogen - Electric charge pushing oxygen into magnesium : center of every pressure point of the layers of the ground. Arsenic - material pressure pushing oxygen into magnesium/Tracion - plasma pushing oxygen into magnesium : Below every Nitrogen pressure point in the layer of the ground. Bismuth - Magma pushing oxygen elements into magnesium elements/Alberton strong wind pushing oxygen type elements into magnesium type elements : Very Center of the Earth united with the central Nitrogen electrical charge component of pushing oxygen/selenium type elements into magnesium/radium type elements - AND also united with these, is the natural magnesium/radium centered Fiber Optics complex of triangulation - or in other-words, the creation and mitigation of unbreakable complexes of information, which are free to roam the Universe searching for supplemental information, like comets and even microscopic elements. These 3 components of Bismuth-Alberton / Nitrogen-Nitrogen / and Fiber Optic center - creates a space where wind blows the heaviest recycling elements through the smallest differences, and turning them into complexes of unbreakable information. As the oxygen moves towards the magnesium and slows down, it's link in the Nitrogen-Nitrogen Electric charge component slows down, in which case the electrical energy slows down, in which case it unites with water - since decelerating electrical charges unite with water - and accelerating electric charges create a greater number of water repelling moments than attracting moments. Electron neutrinos moving slower than Alberton creates strong winds. Electron neutrinos moving slower than Tracion creates plasma. Electron neutrinos moving slower than Nitrogen causes Lightning. Electron neutrinos moving slower than Arsenic causes earth quakes. Electron neutrinos moving slower than Bismuth causes Magma to be created. Electron neutrinos as a component are almost identical in a majority of ways, to first generation non-isotopic silicon - which is one of the main components of all water.